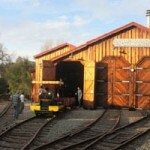 Take A Step Back In Time At Historic Old Poway Park! 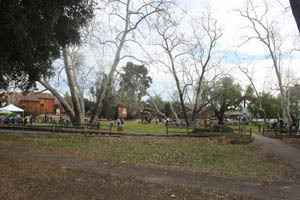 When you visit Old Poway Park, it’s like taking a step back in time. Back to a time when horse drawn carriages and steam trains were the main modes of transportation, and artisans handcrafted everything from clothes, to toys, to furniture. We took a trip there this past weekend for the Train Song Festival, and once again I was reminded how much we enjoy this special park as a family. I originally wrote this post as a printed article for the 2012 Mom’s Guide To San Diego, but am just now sharing it here. I’ve updated the article, and included some new information that wasn’t in the printed format. I hope it inspires you to take a trip there with your family as well. DAY TRIP TO OLD POWAY PARK! Living in San Diego, we are so lucky to have an abundance of options for fun day trips. We live in a city where we can visit the mountains, desert, and ocean all in one day! One day trip my family loves is to Old Poway Park. When you go to Old Poway Park, it feels like you take a step back in time. It’s a beautiful park with mature trees, plentiful grass, nice walking paths, and a cute little creek. It also has a neat and informative Heritage Museum, historic buildings which were brought to the site, working railway, Blacksmith Shop, and a toy train shop inside the Train Depot. 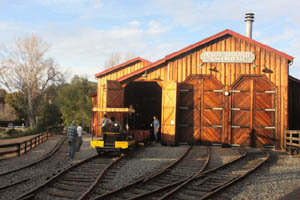 Our kids love trains, and the antique ones which are part of the Poway Midland Railroad, at Old Poway Park, are no exception! They have a steam locomotive, trolley, and a Speeder Car that take turns running most weekends of the year. Train tickets are reasonably priced between $1.50 – $2.50 for adults depending upon the train running, and just .50 cents per child (kids under 2 are free!). It’s fun to take a few spins around the 1/2 mile track. Old Poway Park is a great place to picnic. You can pack a lunch and enjoy the afternoon on the grass, or at one of the picnic tables. If you like to barbeque, they have barbeques available for use. If you’d rather buy lunch or dinner, The Hamburger Factory, located within the park, has delicious food in a fun atmosphere. Sometimes we go there just for the dessert! The park hosts the Poway Farmer’s Market from 8:00am – 11:30am on Saturday mornings. The Boardwalk Craft Market, with arts and crafts made by local artisans, happens on certain Saturdays as well. 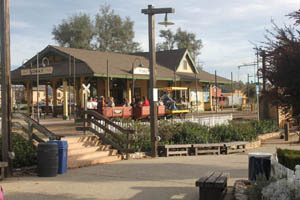 The park also has special events for the family including a Train Song Festival, Old-Fashioned 4th of July, Halloween festivities, and Christmas in the Park. Oftentimes they have persons dressed in 1800’s attire, and include fun activities such as train robbery reenactments, which are make the experience all that more memorable. Be sure to set aside a few hours for your first visit. It’s fun to take your time exploring. Also, bring your camera, as it’s a great place to take family photos. As you’ll see when you visit, it’s very popular with professional photographers! Although there is no playground equipment at Old Poway Park, there is a playground right across the street at Aubrey Park. Parking is free at both Aubrey Park, and in and around Old Poway Park. Restrooms are available at both parks as well. 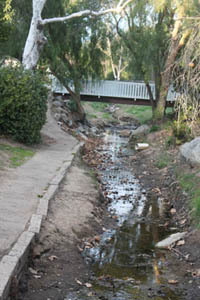 Old Poway Park is located at 14134 Midland Rd., in Poway. For more information, visit www.poway.org, and search for detailed info about the park using the drop down menu on the left. Perhaps we’ll see you there!